The stock Music app allows users to add lyrics to songs in their library, however the process of adding them is long and in some cases not worth it. The new LyricForMusic tweak makes the life of iOS users easier by instantly adding lyrics to any now playing song. The best thing about this tweak is that in addition to working with the songs in your library it also adds lyrics for Apple Music, Radio and songs purchased from the iTunes Store. 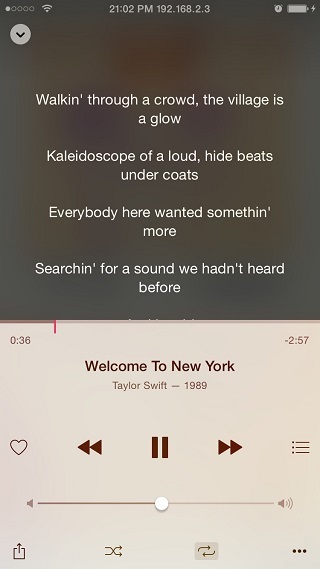 The tweak integrates with iOS 8.4’s Music app and fetches the song lyrics from the Internet. How LyricForMusic works is pretty simple, all you have to do is access the Now Playing screen and tap on the album artwork area. Once you tap on it the tweak will instantly show you the lyrics. Once you are done reading them you can tap on the lyrics area to get the artwork back. So next time you are listening to Apple Music or Radio in the new Music app and come across a good song, all you have to do is tap on the album artwork to get its lyrics. And if you really like the song and its lyrics, you can also download it for offline listening. More on Apple Music offline listening feature here. Needless to say, you need a working Internet connection for this tweak to work. You can download LyricForMusic tweak from Cydia for free.